In late Channel season 2011 I was in Varne Ridge to crew a solo. Present for that tide were a bunch of Channel Aspirants from Western Australia, advised by seven-times world open water champion Shelley Taylor-Smith. They had had a long wait with bad weather. One of the swimmers was UK-born but WA resident Paul Newsome, the coach behind the popular swimming website SwimSmooth.com and we got to chat the day after his Solo, which had been in very challenging Force 5 conditions, (making him, like me, a member of the unofficial Force 5 Channel club). SwimSmooth takes the rational approach that there isn’t a single style, that in fact there are different ways of swimming, especially for new and intermediate swimmers, and that there are appropriate progression paths for those styles. It doesn’t try to squeeze everyone into the same (useless) mould. 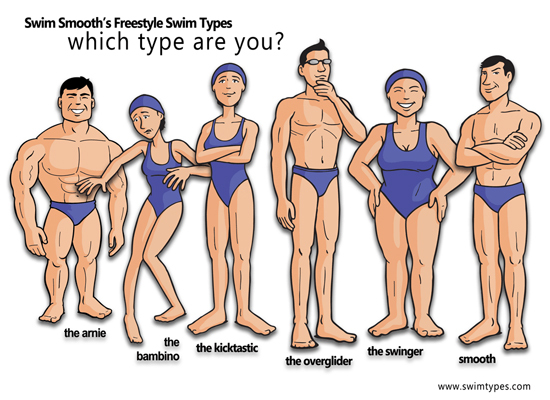 SwimSmooth sets out six initial styles but the coaches aren’t tied into insisting that everyone is one of the styles, as people can demonstrate aspects of different styles. SwimSmooth also specialises in open water swimming, realising that there are many other aspects of open water swimming outside just the stroke that affect swimmers. A well-known aspect of SwimSmooth is their use of technology, (driven mostly by Paul’s SwimSmooth partner, Channel crew and swimming coach, Adam Young). These include their famous Mr. Smooth animation (at which I’m sure thousands have stared for long periods), the integration of Paul’s Feel For the Water Blog, and the thorough use of video comparison technology for stroke analysis, that previously would only have been available to elite swimmers. Video analysis is probably the most powerful technique tool of all apart from having your own elite coach. 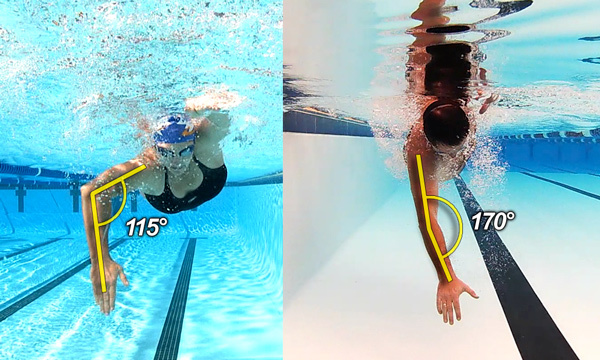 SwimSmooth doesn’t engage in Trademarking of well-known swim drills as some others have done. Instead a small selection of appropriate drills are used to address each swimmer’s deficiencies, something many new swimmer’s have no idea how to approach. Unlike Total Immersion, of which I’ve already written some (but not all) of my criticisms, Paul has walked or more precisely, swam the talk. 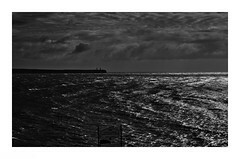 He took on the Channel in Force 5 winds and prevailed, still achieving a fantastic time, better than most on a good day. Last week I saw on Paul’s Twitter feed that he was heading for the UK’s swimming centre for excellence in Loughborough (pronounced Luff-burr-o). Last week he tweeted that he was also coming to Ireland for Coach and swim clinics and needed some guinea pigs for video analysis. I saw the Tweet too late and responded but I’d missed the opportunity. I also told Paul I’d hoped to add his autograph to the book. But it all worked out because two days later Paul offered me a cancellation place on the March 17th St. Patrick’s Day swim clinic. 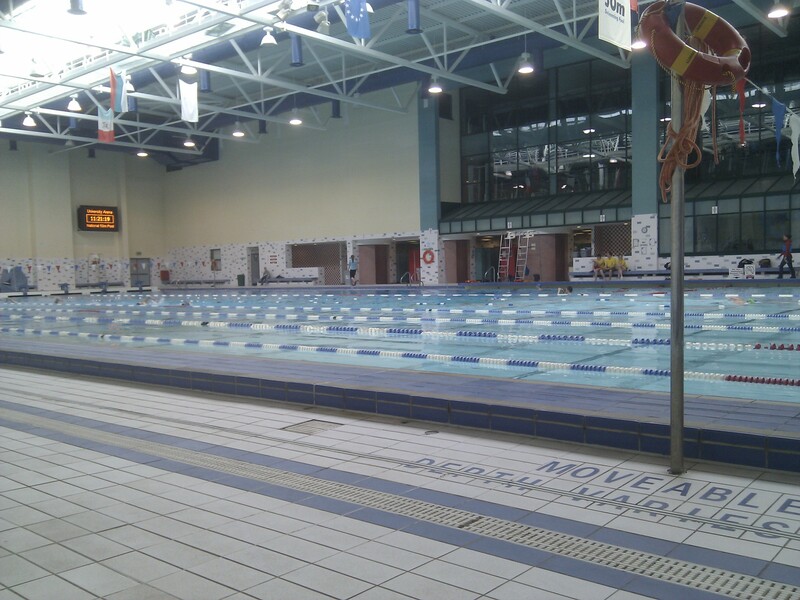 The University of Limerick Pool is one of Ireland’s only three 50 metres pools, and one of the two High Performance Centres, where Irish International Marathon Swimmer Chris Bryan trains, along with some of Ireland’s Olympic swimmers and hopefuls. Paul made the point that the Perth centre alone where SwimSmooth is based has three 50 metre pools, and over twenty 50 metre pools to serve its population of 1.2 million. The almost total abandonment of our sport is of course something most Irish swimmers feel keenly. For example Waterford Institute of Technology, (the nearest college to me), has been building a large Sports Campus. A Sports Campus … with no pool. But instead of a pool there’s a (now abandoned) business conference centre. The twelve swimmers on the course arrived at the pool at the 10 a.m. opening (St. Patrick’s Day, national holiday) and met Paul and his SwimSmooth partner Adam Young, UK Swim Smooth coach Emma Bunting, and another twelve coaches who were on a three-day SwimSmooth Coaching course, which included English Channel relay swimmer and Solo Aspirant? Jill Bunyan. The swimmers were from around Ireland but the coaches were more geographically diverse, including Jill from the Isle of Man, coaches from Ireland, UK, Scotland, and as far as Hong Kong. We spent about an hour on introductions, everyone speaking about their experience and their own stroke problems. As I’d said to Paul earlier in the week, I have no local club to swim with, and no coach. Since swimming is really a two-person sport, the swimmer constantly requiring the intervention of a coach, I knew my stroke would have problems. Though I didn’t say it, in my own mind, every single aspect of my stroke was likely to have issues. All the training I do only reinforces any poor technique where I am not aware of it. And most swimmers are not aware of their technique problems. 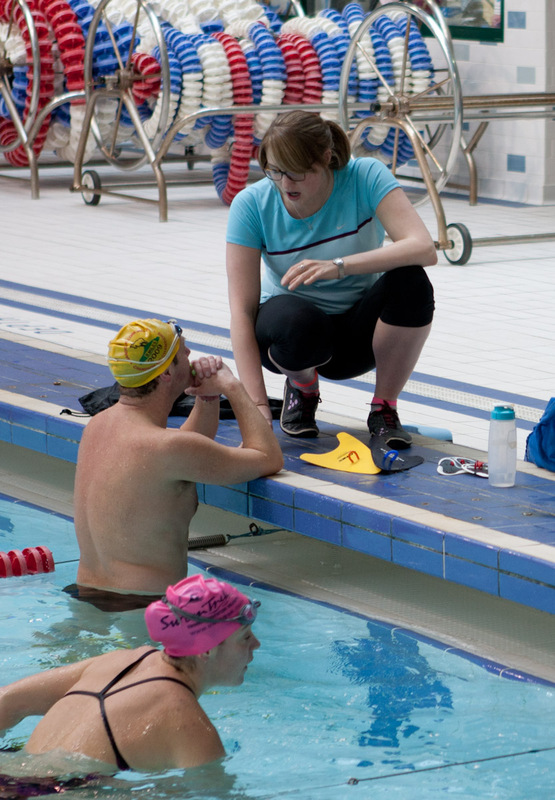 We were also quickly introduced to personal swim coaches from those on their coach’s course, my coach was Cassie. There followed a quick discussion of stroke, deliberately short so Paul would not be putting clutter into people’s minds just before swimming. We also saw some fantastic video that Adam and Paul had taken of Becky Adlington’s and Shelly Taylor-Smith’s strokes. I warmed up, enjoying the luxury of the 50m length, since I’d be one of the last recorded, while Paul videoed each swimmer using a remote camera on a boom, recording front, side, over- and underwater angles. Example of the video stroke analysis during the clinic. Neither of these swimmers is me! After a working lunch, (there was no wasted time in the entire day) Paul started stroke analysis of each swimmer’s video. The last time I have video analysis of my stroke I felt terrible embarrassment when I saw myself. But I prefer to improve more than I care about embarrassement. I hoped there had been improvement since then, and there was in some areas, but other areas had deteriorated. My cruising open water or long pool distance bilateral stroke was okay (later in the pool Paul said it looked smooth and like I could go for ever, which is what I train for and which was a relief) but the video of my single-sided “speed” stroke showed ( I asked him to do both) appalling and multiple stroke errors. Paul made some suggestions. I could already see, based on all the EVF work I’ve been doing for the last year, how in fact I’d caused the other problems, and some problems were utterly invisible to me (such as a slight left arm crossover when breathing right) . On Paul’s YouTube Channel there’s a good example of his analysis and tools in a long video. I don’t have Paul’s coaching experience obviously, but I have enough swim experience and coaching knowledge to analyse someone else’s stroke. This is the irony of swimming, that what we see in others we can’t see in ourselves. 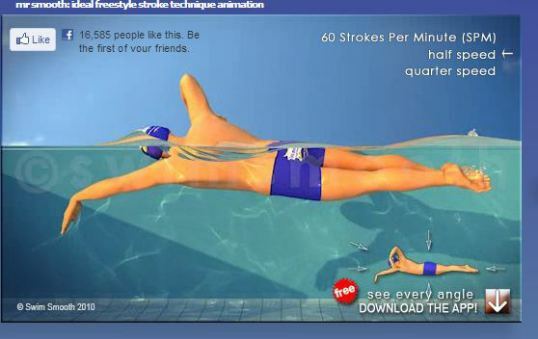 For an experienced swimmer, seeing their own stroke says more than any words. Paul also spent some time on open water skills and advice, addressing such issues as turning, rough water, and anxiety. Next we moved back to the pool and did a range of drills, none of which were new to me, but some of which I hadn’t done in a long time and which were good to revisit. These drills were chosen by Paul to address the issues of the range of swim abilities present on the course. That range of abilities never became an problem, spread as we were across three 50 metre lanes, and we all had a chance to work more with our individual coaches. The drills included using Finis Freestyle and Agility paddles and pull-buoys. Already being a paddle addict I was hugely impressed by the Agility paddle, (which I’d planned to try anyway after Evan recommended them). I’ve since bought a pair. One of the swimmers on the course, Trish, is an elite swimmer, in time and stroke, and I certainly have plenty of open water experience, even if my swimming speed is average. Yet neither of us felt that anything we did was a waste of time, or in any way dumbed-down, and the time didn’t drag. To satisfy relative beginners through intermediate level, to advanced and elite levels, all in one course, is no mean feat and usually only comes in a squad with time. Swim ability questionnaires filled out by the other swimmers beforehand certainly facilitated this and assisted the excellent organisation on the day. Due to the public holiday UL were keen to shut the pool early so there wasn’t a lot of time to chat. We each came away with a stroke analysis from our coaches, an individual DVD that Adam had generated for each swimmer which included not only the video of our own swimming, but also all the comparison videos, the computer notes and audio from the analysis, and specific drill and swimming advice for each swimmer dependant on Paul’s and the individual coaches assessments. Oh, and a SwimSmooth open water swim cap. (Find the cap). I’ve recently seen someone pay for video swim analysis in which they were only recorded from the side and front from above the water, and the remaining time was spent by the “coach” and swimmer talking on the side of the pool. The SwimSmooth one day swim clinic is so far beyond that as to be almost like comparing two different sports. The clinic offered time-efficient, personalized and top-class stroke analysis, expert coaches, specific open water and drill advice, and stroke remediation, for all levels of ability and experience. I can’t recommend it highly enough. Alternatively, if you are not in a location where you can participate in one of these clinics in the foreseeable future (but remember I’m in the middle-of-nowhere, so you never know), the SwimSmooth blog, has some excellent free technique and drill resources for all levels, and there’s the SwimSmooth DVDs and books, also highly recommended. Paul & Donal. Not only is he faster, he’s younger and better looking. And now finally added to my marathon swimmer’s autograph book. I expect a Top Five and very possibly a Top Three place for Paul in this year’s MIMS when the large Irish and Aussie contingent will account for over a third of the entire field. Cassie? Is that Cassie Patten, the Olympic 10K bronze medalist? Lucky you! Enjoyed the stuff about “swimming the talk,” etc. Great review. I did their “what type are you test” about 2 weeks back and had an “aha” moment but was concerned if they were the real deal or not. So timely review! Thanks.Will give them a much closer look. It was a great run clinic, and your review is spot on. I travelled a fair distance for the clinic, and it was completely worth the time & money. 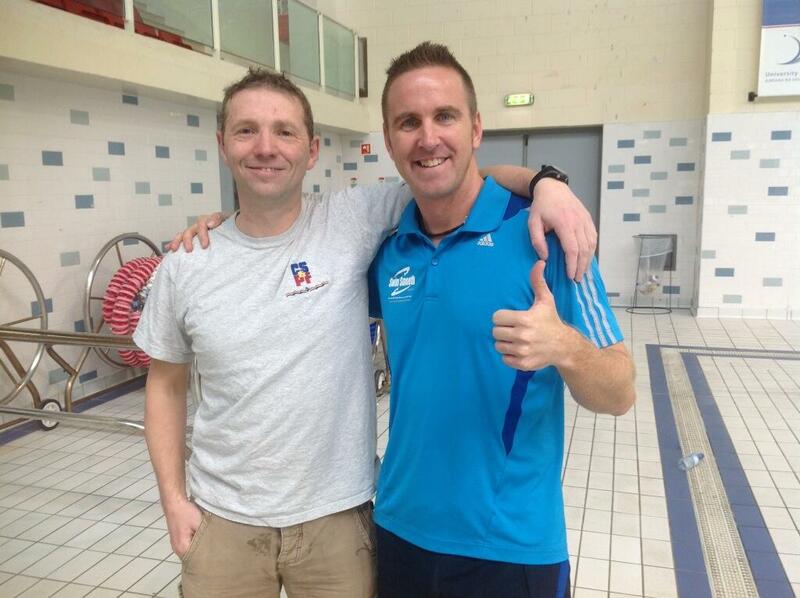 Thanks and good to meet you also Jeff, give me a shout if you ever around the Copper Coast for a swim. I liked this Donal…I’m doing the Mallorca Open Water Festival week with them so now looking forward to it.